Bored of city life? Want somewhere close to Bangkok but worthwhile a visit? Then Samut Songkhram province is the right choice for you. Less than two hours drive by car, you can easily make a one day trip to Samut Songkhram. Let's discover what can you do there! There is no doubt that most of you will have heard of the name of this famous Amphawa Floating Market before. At this floating market, there is a variety of Thai food, fruit and desserts for you to try. In addition, they also sell a lot of souvenirs. After you take a long-tailed boat to observe the local people's lifestyle, get on board, and order seafood cooked freshly on the boat to be enjoyed whilst you watch the sunset, eat seafood, and enjoy your slow-life time with your friends, lovers, or family. Located beside Amphawa Floating Market, this King Rama II Memorial Park is dedicated to our beloved King Rama II's art and culture achievements. Inside this park, there are several Thai traditional houses that you can enter and take photos in. Also as you take a walk through each house, you will get a chance to learn more about Thai lifestyle from the past. This is another level of traditional market! 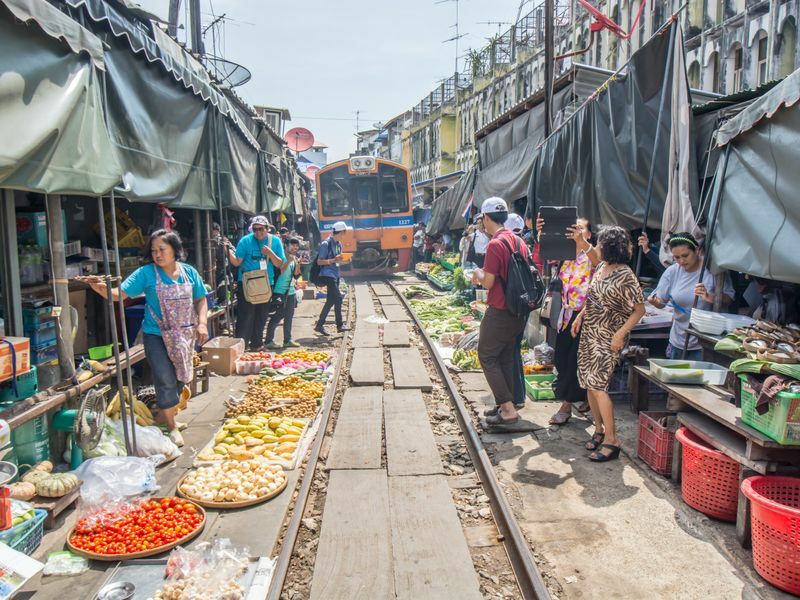 When you first arrive at this market, Maeklong Railway Market might look like a regular traditional market that sells vegetables, fruits, fish, flowers, meat, herbs, spices ... all the things you can normally get at a local market. But don't forget that this market is located beside the train track. So when the train is arriving, all the stalls will pull up their umbrellas to let the train pass. Be prepared to capture this extraordinary show! Boats were one of the major transportation methods that ancient Thai used to get around. At Samut Songkhram province, riding a wooden boat along Maeklong river is a must-try activity for you all to try. While you are on the boat, you can also explore the lives of locals living beside the river. Samut Songkhram province is also famous for its coconut palm sugar. Have you tried it before? Why not try making it for yourself? It's going to be even more fun, getting your hands all messy. 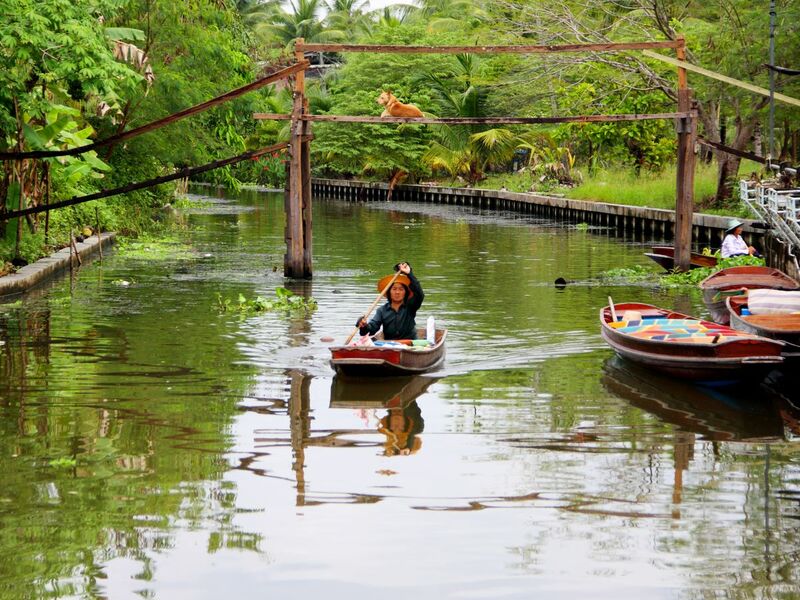 Other than floating markets and temples, Samut Songkhram also offers nature lovers a place to go! You can explore a mangrove forest by a long-tail boat and observe local nature, plant a mangrove tree, catch mussels, and feed monkeys. You can even relax and enjoy lunch at a small house in the middle of the sea. I bet you will not want to go back home anymore! After the entire days strolling through floating market and temples, last but not least, end your day trip to Samut Songkhram by watching the fireflies on the boat. Such a calm and peaceful day indeed! There is so much you can do at Samut Songkhram. Art lover; nature lover; shopping lover... basically anyone is going to have fun here! Back to the Past at Tha Kha Floating Market in Samut Songkram! Boat Riding and Mangrove Planting at Klong Klone Mangrove Forest!